It’s important that you understand some of the terms pertaining to York, ON replacement windows before you start your search. While some things will come standard with windows today, other things are options you can either select or go without. But you need to know what these things are before you can make an informed decision on how to proceed. One of the things you can choose as a value-add when getting replacement windows is a low-E coating. It is an option worth considering, even though it will cost extra. Here’s a look at some of the things about low-E glass that you ought to know before you go window shopping. Low-E Glass. What is it? Low-E is a special layer that is applied to glass so as to direct the sun’s heat out of your home. The reflective substance, which is transparent and won’t adversely impact your ability to see through the window, will basically make your home more comfortable all year. A low-E coating will reduce the quantity of UV and infrared light that is able to get through the glass. How Can You Tell if Your Existing Windows Have Low-E? The low-E layer is so thin that you won’t actually be able to see it with the naked eye, but there is an easy way to determine if windows in your home have it. Try holding an activated flashlight in front of the window you want to test. If you have a double pane window unit, you should see four different reflections of the light coming from the flashlight. Here’s what to look for: If the window you’re testing has the low-E coating, then one of the four images will have a different color than do the other three. If all the images are the same colour, the window lacks low-E. There are many benefits of a low-E coating. For instance, it will improve energy efficiency by, during the winter period, reducing heat loss and by, during the summer, lessening heat gain. It will also lessen condensation problems. Another benefit is that it will reduce the amount of UV rays that get into your home, which will help to keep you and your family safer since these rays can be harmful. The interior comfort of your home will also be increased since glass treated with a low-E coating will have better energy efficiency and insulation properties. The thing with UV rays is that they can prematurely fade not only your furniture, but also your flooring, window coverings and other things. So it can be a major problem over time. But with a low-E coating, your windows will be able to nip this problem in the bud right away. 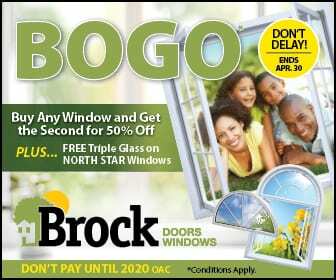 At Brock Doors and Windows Ltd., have the best in York, ON replacement windows. During your free consultation, we can help you find the perfect window options for your home. When you contact us at our Innisfil location, we’ll listen to what you want, make recommendations and then get down to business. Call us at (705) 431-7087 or visit us in person at 2347 Industrial Park Rd Innisfil, ON L9S 3V9.